Indiana is back in Simon Skjodt Assembly Hall to continue the four-game Hoosier Tipoff Classic on Wednesday night. The Hoosiers will host Arkansas State for the first ever meeting between the two programs. Arkansas State is 2-2 with home wins over Abilene Christian and Howard and losses at Evansville and Eastern Michigan. After a strong second half performance against South Florida, Indiana has two games remaining before a gauntlet of contests that will be unforgiving. But before Indiana hosts Duke next week in the Big Ten-ACC Challenge and then digs into conference play next weekend, the Hoosiers will wrap up the four-game Hoosier Tipoff Classic this week in Bloomington. First up, the Hoosiers will host Arkansas State of the Sun Belt Conference. The Red Wolves are coached by Mike Balado, a former Louisville assistant who is in his first season in Jonesboro. Arkansas State was picked to finish seventh in the Sun Belt, a 12-team league. Arkansas State is an upgrade over some of the lower tier Division I programs that Indiana fans have been accustomed to seeing in Simon Skjodt Assembly Hall in recent seasons. Upgrading the guarantee game portion of the non-conference schedule is a priority in Bloomington and as of today, the Hoosiers only have one sub-300 KenPom team on the docket. The Red Wolves won 20 games last season and their coach, Grant McCasland, departed after just one season for North Texas, a Conference USA job. As a result, the cupboard wasn’t left bare for Balado as three starters are back from last season’s club. Through four games, Arkansas State’s best player has been Ty Cockfield, a 5-foot-11 junior college transfer. He’s averaging a team-high 17.8 points on 55.1 percent shooting from the field. Cockfield is shooting 50 percent on 3s thus far and is coming off a 25-point, seven rebound, three assist and zero turnover performance against Howard. Senior Rashad Lindsey, another 5-foot-11 guard, has started all four games with Cockfield in the Arkansas State backcourt. He’s struggled to take care of the ball (23.8 TO%, per KenPom) and has an effective field goal percentage of just 42.9. Connor Kern, a 6-foot-4 sophomore, has started three of the team’s four games and is 5-of-12 on 3s. He’s averaging 5.3 points per game. The wildcard on the roster to this point is 6-foot-4 senior Deven Simms, the team’s second leading scorer at 15 points per game. Simms had a combined 45 points against Abilene Christian and Eastern Michigan, but played just six minutes in Monday’s win over Howard. Simms averaged 13.4 points and five rebounds off the bench last season for Arkansas State. The frontcourt names to know are Tamas Bruce, Grantham Gillard and Tristan Walley. The 6-foot-7 Bruce has started all four games, but is averaging 8.1 fouls per 40 minutes, according to KenPom. He’s the team’s third leading scorer (12.5 ppg) and currently ranks in the top 100 nationally in offensive rebounding percentage. Gillard is 6-foot-4 and undersized as a four man, but has done a solid job of getting to the foul line. Through four games, his free throw rate (FTA/FGA) is 73.7 percent and he’s connecting at a 85 percent clip from the line. Walley is a 6-foot-7 junior college transfer who can block shots. Through four games, he’s averaging 4.3 points and 5.5 rebounds per game. One significant challenge for Arkansas State is its lack of size. The Red Wolves have just one rotation player taller than 6-foot-7 and it’s 6-foot-9 freshman Jake Scoggins, who is playing just 9.5 minutes per game. Indiana has struggled with turnovers through four games, but Arkansas State has been even worse at taking care of the ball. The Red Wolves currently rank 329th nationally in turnover percentage at 24.8. Indiana’s turnover percentage of 22 is 269th nationally. Defensively, Indiana has struggled to defend the 3-point line, but currently sits 71st nationally in 2-point field goal percentage defense and 27th in block percentage. Arkansas State, meanwhile, has been awful at defending 2s (56.3 percent), but opponents are shooting just 27.1 percent on 3s so far against the Red Wolves. A lot of that probably has to do with Arkansas State’s lack of size inside and the quality of opponents thus far when looking at the 3-point shooting. This is a game where Indiana can’t settle for perimeter shots. 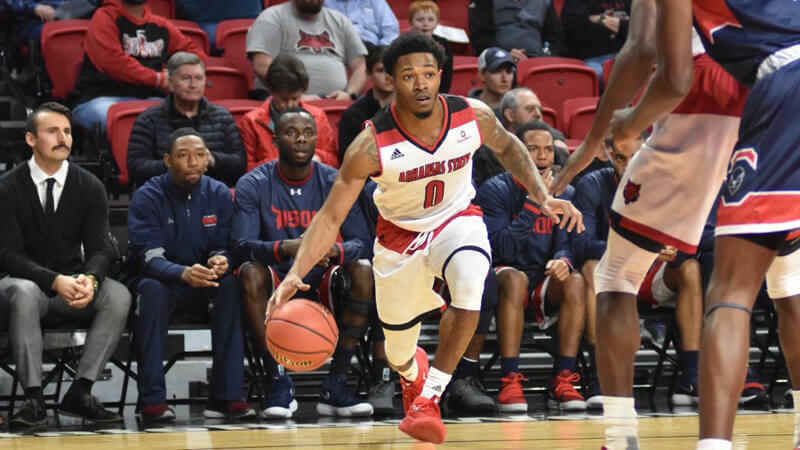 Arkansas State is sending opponents to the free throw line frequently – the Red Wolves rank 298th nationally in opponent free throw rate – so this is a matchup where De’Ron Davis should get plenty of touches. Nothing has come easy for Indiana so far this season as the Hoosiers trailed South Florida at halftime the last time out before pulling away in the second half. The KenPom projection for Wednesday is Indiana by 11 with an 84 percent chance of victory. Sagarin likes the Hoosiers by 11.5. Sunday’s second half was arguably Indiana’s best 20 minutes of basketball of the season, but the Hoosiers have yet to put together a full 40 minute performance through two exhibitions and four regular season games. While it’s only 11 days into the season, a beefed up non-conference schedule means that Indiana doesn’t have much time to fix its issues. After Wednesday, Indiana will play seven straight against teams currently ranked in the top 153 of KenPom’s rankings. Will be watching to see who is matched up against Ty Cockfield and how the team defends the three point line – which has been a struggle so far. I hope we wee RoJo or Devonte matched up with him. Second, I will be watching how many fouls we draw and FTs we take. Drawing fouls is foundational to Archie’s system and can be exploited against this team. Hopefully this team continues to build on some postive momentum, carries it over against Eastern, and then plays like they have nothing to lose against Duke. I agree with you on momentum EMU has a 111 RPI Duke is 42 I know it’s a significant jump but confidence and momentum can do a lot for a team. Clifton Moore breakout in a tasty matchup! Double digit points! I like that lineup. However, Hartman is so brittle they may have to rap his entire body. How can you profile an opponent, AR St, that has played a common opponent, Howard, and not review how IU played Howard and how Ar St played them? I am hoping he starts because I think he will be in the starting line up if he stays healthy. This would also give us a good understanding of what our team would look like in the future as well. Collin probably won’t start, but I wouldn’t think there would be much variation in Archie’s starting lineup. The givens are DD, JM, RJ. Pretty sure that JN and DG are going to be the starting guards. Only change I can see is Al starting in the stead of Josh. First off the bench will probably be Justin and either Al or Josh, depending on which of those two start. Our defense, drawing fouls, and our height should be an advantage and a focus. Let’s get a fast start, shut down their shooters, and get a monster game from De’Ron! Archie seems to be careful with starting guys that have injuries and are not practicing full-time. I doubt we see Collin start any time soon if at all. With Al playing better and Josh being nicked up, I expect Al to get the start. Hopefully Collin can start to play some to get his timing and conditioning back. If Collin can play some, I think we start to see a much smaller rotation that is focused on 4 guards and 4 bigs. If Collin can play, I think we will see reduced minutes from Freddy and Cujo and probably CM goes farther out of the rotation. Speaking of Arkansas State, anyone else a little concerned about the recent Romeo to Vandy predictions on 24/7? transitive property analyses are somewhat limited in college basketball… you expect alex to do the same for all of our Big 10 games when everyone is playing each other? I would give up on wishing for Romeo, he put Vandy in his top 3 for a reason over a school like UNC. If he wants to win, compete for a championship and do the whole one and done thing he will go to Kansas if he wants to play with his other 5 star buddies like he has said several times he will go to Vandy. Unfortunately IU cannot offer either. I never got my hopes up with him because of the ground Archie had to make up and then when Darius committed I pretty much accepted it. Would still love to see him in Bloomington, though. Heres what i’m hoping for. 12 or less turnovers. Keep them in the 60s, with us in the 70s or more. Some good minutes for Moore. I think he will go to Vandy, but if he would choose IU he would be the featured player next year, learn to play defense, help return IU to national prominence, and become a legend in the the state of Indiana. He’s going to the NBA in a year or two anywhere he plays. I’d like to see him get some good minutes these next two games so he can learn defensively. We will need his size against Duke and big ten foes. He is talented enough to be the featured player at any school in the country, no HS recruit puts any substantial wait on “learning defense”, as far as his HS career goes he already is a legend in Indiana and i dont see a quick season at IU significantly impacting his legacy. Also he grew up rooting for and watching Louisville basketball not IU so he hardly feels that “staying home” pride that Darius and others in the past have felt. Well, ok then, that’s that. You related to him? Agreed, and then regarding scoring, I’d like to see 30 or fewer points each half. Can’t count on holding them to 19 points in the second half, so have to start out stronger. We have quite a height advantage. I would like to see a lot of posting up. Even with our guards. Then it’s been a pleasure chatting with a legend. He’s a legend, at wasting your time. This guy isn’t an IU fan, that’s why he is saying what he is. Romeo put us in his top 3 over UNC also. We have a great shot at him. why would i be reading and commenting on articles about indiana basketball, know all the players, have more knowledge on the team and basketball in general than you and not be a fan? You don’t know jack, and definitely not more than the average site visitor. I’d say your in the bottom 5% then. Booby trap, recognize and move on. I doubt Sarge would recognize a booby in any form. Doubtful. Why would Romeo opt for being the #2 recruit at a non-basketball school, in a football state, in a city where Vandy sports are the fourth option to Music, The Titans, and The TN Vols football? Not at Vandy! He will always be #2 to Darius in Darius’ hometown! Like what you’re doing here…. I have this little problem at my house . I lived close to Arkansas State for a while and my oldest daughter thought she needed a redwolves shirt so she could be like her friends Yesterday I opened my closet and there is that shirt do I burn it or do I wear it and put a reverse hex on them ? Coach has already said that Hartman will not play this game, but when he is 100% healthy, he is currently tthe most experienced and talented player on this team! Most talented? I’d have to give the nod to Green, Durham or Smitty.